A top-selling mariachi album landed a prestigious Latin Grammy nomination. Its main singers? They're public school kids from Chicago. The unlikely story started with an idea that came to Chicago resident César Maldonado. Born in the Brighton Park area of the city, Maldonado's parents were immigrants from Durango, Mexico. His parents were factory workers and did not know English. Maldonado excelled in school, and at 33, is a successful investment banker living in Chicago. Maldonado wanted to give back, and he remembered that his elementary school never offered music or arts classes. He decided this is where he could make a difference for the next generation of young Mexican-Americans. Maldonado did not have a music background, except for a deep appreciation for mariachi music — his parents played it constantly on the radio while he was growing up. So he decided to found the Mariachi Heritage Foundation (MHF) in 2013. Since then, the non-profit has grown to incorporate mariachi music education in the curriculum of eight of Chicago’s public schools, involving 2,100 students in grades 3 through 8. As part of one of MHF’s programs, sixteen students, ages 11–to 18, were chosen, by audition, to take part in creating the group’s debut album, “Nuestra Herencia” (“Our Heritage”). After only about a year playing together, the group’s album was released this past May — and then it just took off. "Nuestra Herencia" reached #2 Top Latin Album on iTunes– marking it one of the most successful mariachi album releases in history. It's also believed to be the first major mariachi recordings released by a student ensemble in the U.S. It nabbed a Latin Grammy nomination in the “Best Ranchero/Mariachi Album” category. “Nuestra Herencia” was produced and arranged by Los Angeles mariachi master José Hernandez. It also features celebrated guest musicians from Mexico such as, Mariachi Vargas de Tecalitlán, and the top three Los Angeles ensembles, Los Camperos, Sol de México, and the all-female Reyna de Los Angeles recorded vocals on the album. The CD also includes tributes to Juan Gabriel and José Alfredo Jiménez. According to the U.S. Census, Chicago’s Hispanic population grew by 17,000, from 2015 to 2016, and is now the second-largest ethnic group in the city (30 percent of the population). 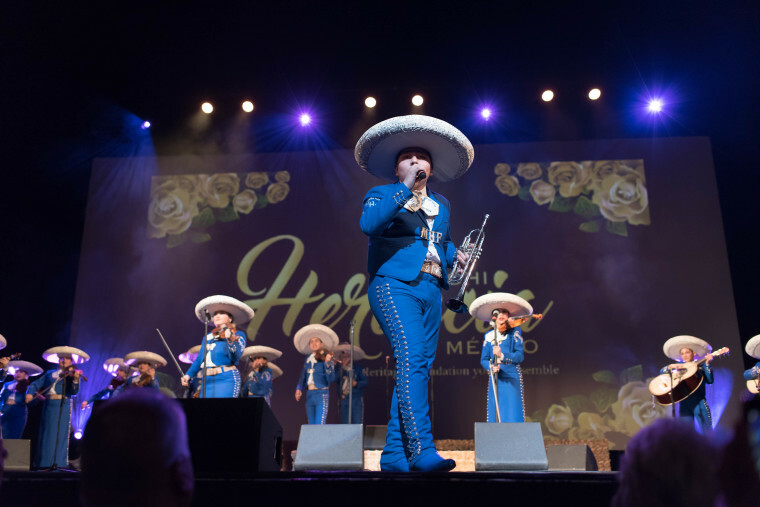 Maldonado hopes that through the integratiion of mariachi into the schools’ curriculums, it will help the students form a connection to their roots and thus increase their pride and self-esteem. Maldonado said the idea for album came about in 2016, when the Latin Grammys, for the first time, suspended the mariachi genre for not having enough submissions. Maldonado hired the acclaimed José Hernandez and brought him to Chicago four times to work with the students. Maldonado is excited for the future, for both the genre and his band. Maldonado thinks mariachi is almost becoming more popular in the U.S. than in its native Mexico.